Employers and job seekers know that LinkedIn is the single most important tool for recruiting talent. Employers often review a LinkedIn profile as much (if not more) than a resume to determine your skills and qualifications before hiring. For skills assessment, LinkedIn is a tremendous tool for recruiters to be able to accurately analyze how a candidates skill set would match their open position. Furthermore, organizations like Skillful are working with employers to educate them on skills based hiring decisions versus more traditional hiring methods. At Digital Workshop Center, we have been working closely with LinkedIn to build our official school page. The goal is to create a central place for DWC alumni to connect and network, as well as employers to filter our alumni by the candidates specific skills. From time to time, DWC is contacted directly about placing some of our students into open positions. While DWC does not do direct career placement, we strive to see our students succeed, and that often means helping a student get the skills they need to get back to work. Going forward, we encourage all unemployed or job seeking DWC alumni on LinkedIn to accurately list the technical skills you have learned while in the classroom. 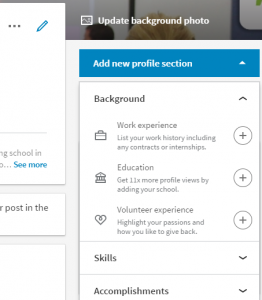 Whether this is a stand-alone class or an entire certification program, having an up to date profile on LinkedIn will be key to your job search now and in the future. When listing your skills or certificates, be sure to list Digital Workshop Center as the school. That way, you can be a part of our alumni on LinkedIn page, and, when employers do ask us for qualified candidates, we can send them directly to that page and your profile will be included in their search. How do I add my DWC classes to LinkedIn? Enter in ‘Digital Workshop Center‘ as the School name, as well as the class or program name you completed, date range, and any other pertinent information. You should now see your Digital Workshop Center programs listed under the education section of your profile! Furthermore, when you visit the DWC alumni page, you should now see your profile included. If you have any questions or need help with the process, please contact us anytime and we are happy to help walk you through it. It’s been our privilege to help countless DWC students get back to work, and we hope that this new community tool will only improve our ability to connect employers with DWC students in the future. Fill out the form below to request more information about Connecting with alumni on LinkedIn or to request information on customized individual or group training sessions.